particularly the improved transparency, reduction of the rollback trigger to 2.5% and the automatic November rollback/tax election requirement. Many taxing jurisdictions exploit escalating property appraisals to impose “stealth” tax increases. This drives gentrification and un-affordability, harmful to Texans struggling to maintain a domicile. Many of these jurisdictions, in an effort to drum up disapproval, falsely claim this legislation caps their revenue, as they fall silent regarding their option to petition voters for higher increases. These same “leaders”, are using threats of emergency service cuts, to extort opposition. They don’t want to be accountable to their citizens and taxpayers. This deceptive behavior is particularly acute in the Austin area. The automatic tax election section is vital and enables the ultimate “local control”; the voice of local citizen voters and taxpayers. We implore the committee members to hold the 2.5% line in this legislation. It is both sensible and logical. Election Code section 3.009 ‘truth in borrowing’ disclosure, is not being respected. Local taxing units have developed a bad habit of routinely violating this statute with impunity. They mislead voters with false cost calculations and misleading claims like “no tax RATE increase” to sell debt. A summary of the disclosure should be required on the ballot showing the proposed measure’s estimated cost per $100,000 of property valuation. Texas property owners should NOT be a perpetual fountain of increasing funding, to slake the unquenchable spending thirst of our local politicians. Let’s vote FOR the Audit, based on the MERITS, not against from a concocted narrative of suspicion, disparagement, partisanship and divisiveness. Proposition ‘K’, a common sense audit, supported by over 32,000 Austin voters, is being demonized and twisted into a partisan issue by a small, politically influential cabal. Critics have no tangible support for their claims, such claims are biased speculation. Shouldn’t we give the audit a chance before criticizing and condemning it? All we taxpayers are demanding is to learn where our escalating property taxes and fees are going and how to use them to our greatest benefit. The unfounded attacks on the audit and its supporters are disturbing. Austin values diversity, acceptance and tolerance, except when it comes to politics. Civility and benefit of doubt are jettisoned for prejudice and suspicion. We’re better than that. Did it occur to these “glass half empty” critics, that it’s a sincere, well-intended proposal to improve our city? The principal PAC pushing “dark money” allegations is itself, neck deep in a “dark money” scheme. A City employee union to PAC1, PAC1 to PAC2, shell game accounts for over 70% of their funding on the latest reports. I spoke with the chief auditors in states opponents said were “damaged” by the audits. Without exception, they repudiated the criticism and spoke positively of the savings and benefits. A city plagued by escalating taxes, rents and unaffordability, should employ every tool. Our new City Manager increased discretionary spending in his proposed budget, let’s hope he will find some savings too, however we should trust and verify. Doing nothing, as some suggest, yields nothing. Austin has never had a comprehensive, independent, efficiency audit. The City of Austin has an audit unit that validates its accounting, regulatory compliance and does some investigative work. However a fully independent, outside efficiency audit is something completely different. AISD routinely uses outside, independent audits to find improvement. Think of it as a medical second opinion for a massive tumor of spending, spending of our rising property taxes. This audit will be under local control of the Mayor and Council, who hires the auditors and approves their recommendations. A population/utility adjusted comparison of Austin’s ($4.1 billion) 2019 budget to our sister city San Antonio ($2.8 billion), reveals Austin spends hundreds of millions more. San Antonio has a larger service area, more emergency service demand, more minorities, children, elderly and greater poverty. Since 2014, both cities grew 5-6%, however Austin’s budget increased 24.5% while San Antonio’s increased 17%. When you’re speaking in billions, that’s significant. According to the Texas Tribune, Austin has TWICE the City employees per citizen that San Antonio has, with a median salary over $10,000 higher! Somehow San Antonio manages to have less traffic congestion, less affordability issues and spend less money. A massive leak in our city spending isn’t being caught by existing methods, let’s get to the bottom of it. Some claim the City has fiscal restraint; but does it? It has quietly exploited increasing property values to impose annual stealth tax increases. Appraised values rose 11% this year, Austin’s tax rate lowered 1%. The City is currently busy hiring high priced lobbyists to fight homeowner and renter protecting, state property tax controls. The Texas Bond Review Board’s latest data show Austin’s existing debt repayment amount is over $10,000 per citizen! That does not include County, Central Health, CapMetro, ACC or AISD debt. Yet, Austin is again proposing a massive borrowing measure; largely for wants, not needs. You’re told the cost for this borrowing is two cents per hundred dollars of value. That claim is disputed by the City’s own legally required 3.009 bond financial impact disclosure that shows FIVE TIMES that amount. This huge discrepancy breeds mistrust, a ‘second opinion’ audit helps restore it. The Austin citizens said they want an independent third party audit on how the city spends its money. AUSTIN — Organizers from Citizens for an Accountable Austin filed a petition with the Austin City Clerk Thursday morning calling for an independent third-party audit on how the City spends its money. Before turning it in, Council Member Ellen Troxclair and former Council Member Don Zimmerman signed on. Michael Searle, the organization’s treasurer, took the lead on turning the petition into the clerk. He said other cities, counties and school districts across the country perform these types of audits and have found areas where they can save. As expected, Austin ISD is following the monopoly government school playbook — shakedown the corporate contractors who stand to profit hundreds of millions from the Bond tax increase for corporate contributions to fund the campaign of lies (e.g. “no tax increase”) to pass the Bond. 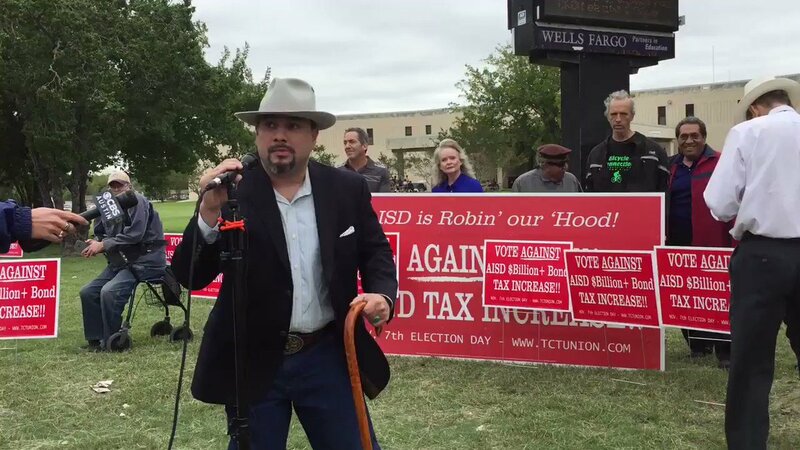 TCTU and local groups kick off campaigns AGAINST AISD Unaffordable, Unsustainable, Unjustified $Billion TAX INCREASE. for their borrowing, based on known fact giving voters a repayment cost per $100,000 for their bond. The TCTU plans to present Travis County our “Truth in Borrowing” award for their transparency and honesty. Bill Aleshire: “You can’t borrow a billion dollars without paying more in taxes than you would pay without this new debt”. MLK Association: “The AISD community, and especially the east side, is being shortchanged and fleeced. We’re voting AGAINST”. of credit agreements executed in connection with the bonds. Austin, TX — The Travis County Taxpayer’s Union (TCTU) is holding a public press conference to announce opposition to the Austin ISD’s $1 Billion Bond “without limit” tax increase, while the District continues to lose students to Public Charter Schools, and small business and families to tax-driven gentrification. TCTU agrees with former Travis County Judge Bill Aleshire: “You can’t borrow a billion dollars without paying more in taxes than you would pay without this new debt”. Mike Lee, Founding President of Austin Area MLK Association: “The AISD community, and especially the east side, is being shortchanged and fleeced. We’re voting AGAINST”. PROPOSITION A, AUSTIN ISD The issuance of $1,050,984,000 school building bonds for the construction, acquisition, rehabilitation, renovation, expansion, improvement, modernization and equipment of school buildings in the district, including (i) technology systems and equipment, (ii) safety and security systems and equipment, (iii) improvements to address overcrowding and safety concerns, (iv) improvements for students with special needs, and (v) reinvention programs for twenty-first century learning; the purchase of the necessary sites for school buildings; and the purchase of new school buses, and the levy, pledge, assessment and collection of ad valorem taxes on all taxable property in the district, sufficient, without limit as to rate or amount, to pay the principal of and interest on the bonds and the costs of credit agreements executed in connection with the bonds. Austin ISD uses 2013 Bond money to pay non-AISD employees to slant T.A. Brown reports – to support $30M replacement, and ignores subcontract engineer’s request for structural foundation analysis. TCTU asks AISD Trustees to fund a truly independent structural foundation analysis with Sparks Engineering from San Antonio. Austin, TX – TCTU calls on Austin ISD Trustees to employ Structural engineering experts at Sparks Engineering, a highly competent, independent company based in San Antonio, for a real “second opinion” of the November 2016 decision to demolish and rebuild T.A. Brown Elementary School. … b) Analyze Channel Capacity: Run analyses as needed to verify original channel sections have enough capacity to support current code loads. TCTU has examined PIR requests which prove this recommended analysis WAS NEVER DONE, and instead, photographs were separated from the report and sensationalized on large posters for the “Press Conference” justifying the school closure. The “second report” was a fourth draft of a similar “Facility Condition Assessment” (FCA) – a total of six FCA reports were produced. The final report, issued in May 2017 and stamped with a P.E. seal, did NOT recommend demolishing the school, but rather recommended two repair options, followed a replacement option, depending on final cost analysis. TCTU also has information from AISD Govalle foundation repairs that suggest AISD Contractors bloated T.A. Brown repair estimates from 5 to 10 times higher than the probable cost (based on known Govalle repair cost). * Field measurements of representative structural elements. In–situ testing for the depth of carbonation in the concrete at up to 5 locations. This will require several small diameter drill probes into the concrete. nitrates and sulfates); 5 samples. iii. Perform a comparative moisture survey at selective locations in the crawlspace. deterioration, to identify the need for strengthening or additional support, as appropriate. * A written report summarizing our observations, opinions, and recommendations. * An opinion of cost for the identified structural repairs or strengthening. TCTU has reviewed extensive public information requests which reveal remarkable conflicts in Austin ISD’s “Facility Condition Assessment” process for T.A. Brown Elementary, which support TCTU’s June 2017 accusation that AISD was deliberately exaggerating T.A. Brown foundation conditions to demolish a repairable school building, to run up the tab. Additional information from “Govalle library” foundation repairs, cited as justification for exorbitant “estimates” for Brown repair, suggest Sunland and AECOM employees inflated repair costs by about 10 times to support a demolition decision. TCTU Director Don Zimmerman adds, “Taxpayers, parents and teachers deserve to know the truth regarding the T.A. Brown school building, and to have diligence in lowering costs and taxes. TCTU calls on Austin ISD Trustees to move forward with an honest second opinion on T.A. Brown”. TCTU Analyst Roger Falk adds, “AISD’s prevarication with respect to Brown Elementary, brings into question their crumbling infrastructure narrative; the AECOM work product highlights a deficit of trust. It appears AISD is more concerned with selling bonds than efficiently maintaining the tax payers property”.